A cold front approaching from the west will stall and keep is in a mother mini-wet pattern for the next few days. 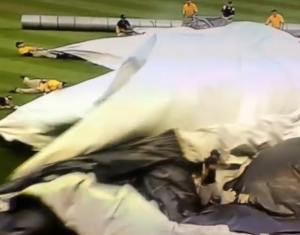 A storm on that front hit Pittsburgh last night with 59 mph winds and resulted in trouble with the tarp trapping a ground crew member. He was OK thanks to the help of some players. See that video below. That particular storm went well north of our region and faded overnight. See how the storms will play out for us today in the simulation below. But the cliche ‘scattered storms’ doesn’t help if you have outdoor plans, but it can be tough to track showers over a particular location with specifics, until they develop with the heat of the day. However, last night I wrote about a focus on Washington to Annapolis and Dover. There will be an upper level impulse that may have a focused cluster this afternoon. The same NAM/WRF Model shown below shows that more clearly, but has shifted the focus north about 40 miles. This appears to follow the trend from June around Baltimore and Harford Counties. Compare that to the short range HRRR Model simulation below as well. As for temperatures, highs will be in the mid to upper 80s and still sticky. Not much variation this week showing the pattern remaining intact, but the weekend should dry out a bit. Be part of my second 321 mile hiking and biking trek across Maryland this August. We still have spots open to join my team for a single day OR Have your company logo on our shirt. Last year I raised $22,000 and the week journey was seen by over 1 million people. See more on the Cool Kids Campaign web site and sign up by July 10th to guarantee your spot.